Lake Shelby, a spring fed freshwater lake in the Gulf State Park, is a great place to spend your vacation whether you are a first time paddler or avid adventurer. 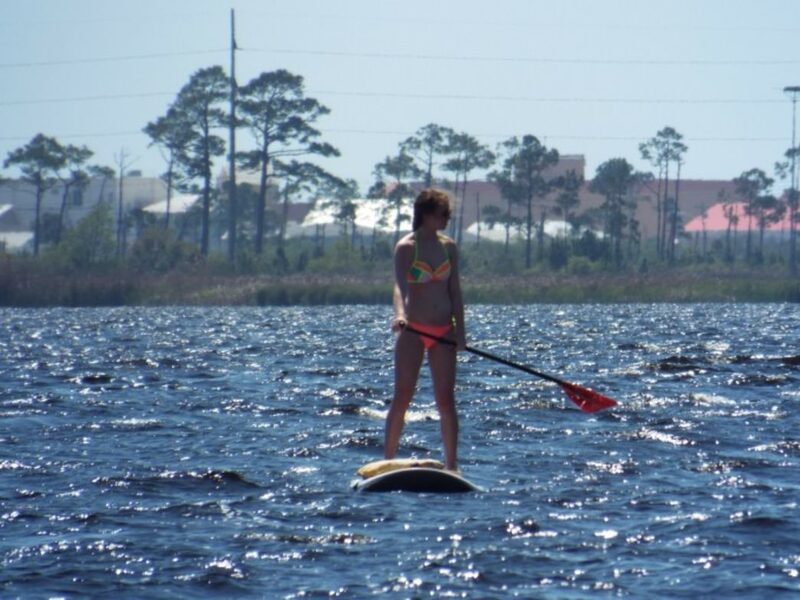 Located in the hub of Gulf Shores and Orange Beach, Lake Shelby is part of the Gulf State Park. With 6,150 acres to explore in the park, paddling is one of the most enjoyable ways to do so. With various bodies of water to launch, one could spend several days exploring all the different areas. For those relatively new to paddling, or for those who do not own kayaks or SUP’s, rentals are readily available on grounds. The lake itself is around 900 acres and is calm. Large oak trees shade the picnic area and several pavilions are available for large groups. Two launch sites are located, one to the left of the entrance and one near the east end of the parking lot. There are no fees for parking. Picnic tables are on a first come first serve basis. The 900 acre lake dips and flows into canals that travel throughout the park. Several can be followed into Little Lagoon, but at various points paddlers will have to get out of the water and cross roads where bridges are too low to go under. Occasional wind gusts can be strong, making the current a bit difficult. However, slight continual breeze from the Gulf keeps the lake cool causing a drift for those wanting to be carried around in their kayak without a whole lot of effort. For those wanting to relax, this is an added bonus. On the opposite shoreline, cabins and campsites, not too far away, are available for those interested in weekend or week long vacations. Fishing with a permit is allowed on Lake Shelby and due to the proactive involvement of the community, fish are plenteous. Lake Shelby is one of three spring-fed freshwater lakes within the Gulf State Park. Middle Lake and Little Lake connect creating a vast marshland and water eco-system that supports alligator, turtle, and osprey habitats to name a few. The lake is a welcomed change from the beach to cool off, relax, and enjoy a more calm paddle experience. Who wouldn’t want to explore a lake with an Alligator Island? There are no fees and Lake Shelby is open only during daylight hours. A dog park is located near the west end of the parking lot near the boat launch. Otherwise, pets must be on a leash. Check here for details. Entrance to Lake Shelby can be found at Gulf Adventure Center at 21101 State Hwy 135, Gulf Shores, AL 36542. Directions are as follows: Beginning at the intersection of AL 59 South and Fort Morgan Hwy 180 East. Veer to the right after red light at Walmart into the Gulf State Park, continue traveling 2.5 miles on the Alabama Coastal Connection. Parking lot for the Gulf Adventure Center and Lake Shelby will be on the left.